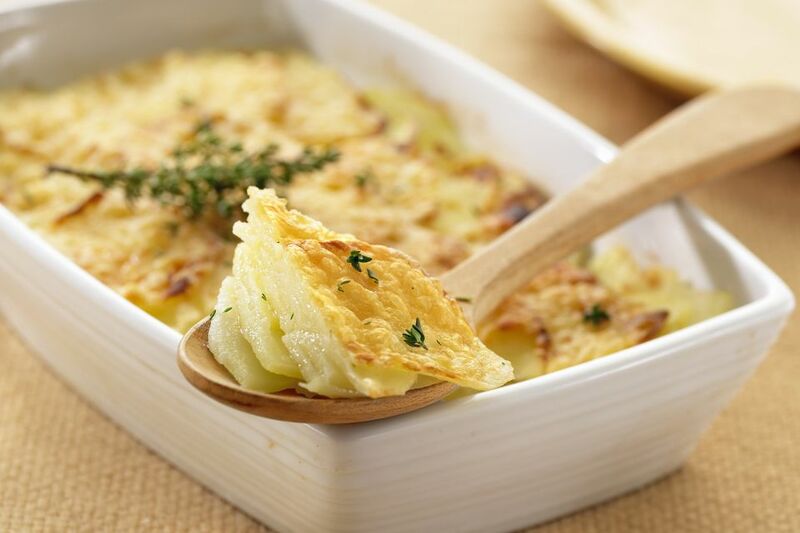 Potatoes Savoyarde is a classical French dish -- a gratin, to be exact, which is any dish topped with cheese and/or buttered bread crumbs. This dish originated in Savoy, high in the French Alps, hence its name. It’s the perfect accompaniment for any meat or fowl prepared in almost any way. We've served it next to beef daube, smoked salmon, and veal saltimbocca. Whatever you serve it with, it's delicious; although, you might want to vary your herbs to more closely complement whichever main dish or other side dishes you choose. Arrange 1/3 of the potatoes in the bottom of a small buttered casserole or soufflé dish (6"to 7" in diameter). Sprinkle with salt, pepper, 1/3 of the garlic, and 1/3 of the cheese. Repeat for two more layers. Add chicken stock, slowly pouring in along the edge to avoid disturbing the layers. Cover snugly with aluminum foil, and bake for 25 minutes. Remove foil, and continue cooking for 20 minutes until browned. If you use vegetable stock in place of chicken stock, this would serve nicely as a vegetarian main course but, because of the cheese, it’s not for vegans. For carnivores, turn this into a main course by adding ham or bacon.